Throughout Maya Angelou's life, from her childhood in Stamps, Arkansas, to her world travels as a bestselling writer, good food has played a central role. Preparing and enjoying homemade meals provides a sense of purpose and calm, accomplishment and connection. Now in Hallelujah The Welcome Table, Angelou shares memories pithy and poignant-and the recipes that helped to make them both indelible and irreplaceable. Angelou tells us about the time she was expelled from school for being afraid to speak-and her mother baked a delicious maple cake to brighten her spirits. She gives us her recipe for short ribs along with a story about a job she had as a cook at a Creole restaurant (never mind that she didn't know how to cook and had no idea what Creole food might entail). There was the time in London when she attended a wretched dinner party full of wretched people; but all wasn't lost-she did experience her initial taste of a savory onion tart. She recounts her very first night in her new home in Sonoma, California, when she invited M. F. K. Fisher over for cassoulet, and the evening Deca Mitford roasted a chicken when she was beyond tipsy-and created Chicken Drunkard Style. And then there was the hearty brunch Angelou made for a homesick Southerner, a meal that earned her both a job offer and a prophetic compliment: "If you can write half as good as you can cook, you are going to be famous." 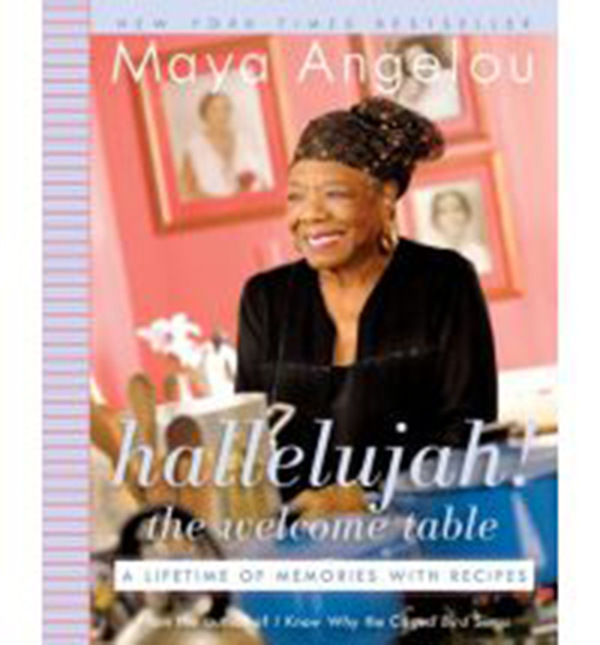 Maya Angelou is renowned in her wide and generous circle of friends as a marvelous chef. Her kitchen is a social center. From fried meat pies, chicken livers, and beef Wellington to caramel cake, bread pudding, and chocolate eclairs, the one hundred-plus recipes included here are all tried and true, and come from Angelou's heart and her home. Hallelujah The Welcome Table is a stunning collaboration between the two things Angelou loves best: writing and cooking.